Coming to Bac Ha District in Lao Cai Province this season, tourists will be impressed with the colorful costumes of H’Mong ethnic people, the horses’ neighs and screams of mountainous pigs intermingled with the sounds of hammers on the fire of blacksmiths. But, more importantly they will have a chance to enjoy Tam Hoa plums a tasty specialty of the district. In comparison with Sapa, the market in Bac Ha on Sunday mornings is attractive but is a simple affair. Located 69 kilometers from Lao Cai Township, there are three buses daily to Bac Ha from Lao Cai bus station at 6 a.m., 11 a.m. and 1 p.m. Tourists from Hanoi can catch a train to Pho Lu then take a motorbike taxi to Bac Ha for 50km. 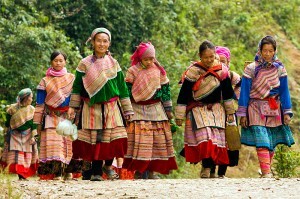 Also from Sapa travelers can hire a Minsk bike to Bac Ha with the 80km journey taking three hours. Trung Do ancient citadel, Hoang A Tuong Palace, Ta Chai communal tourist area, Tien Cave or Co Tien Mountain and the Tam Hoa plum forests are destinations you just can’t afford to miss on your trip to Bac Ha. Plum trees grow in hillsides, in plains stuck by mountains and in local gardens. 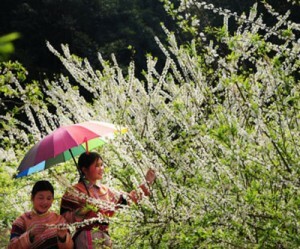 Many tourists are very excited to experience the pristine land, picking themselves red plums and enjoying the corn wine when visiting local houses. Tourists can stay overnight in Ban Pho, Ta Chai, Bao Nhai and Na Hoi.